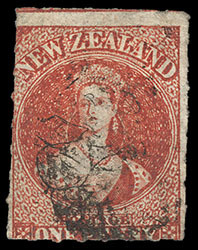 New Zealand, 1864, Queen Victoria "Chalon Head", 1d carmine vermilion, rouletted 7, N Z watermark, showing rouletting on all four sides, which is unusual for this issue, rich color, cancelled by indistinct numeral "1" barred oval, Fine and rare stamp; with 1989 Holcombe certificate. Scott No. 27a. Campbell Paterson No. A1j (Y). SG No. 101 £3,000 ($3,940). 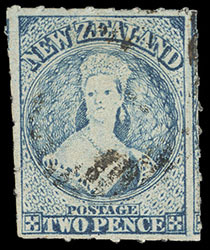 New Zealand, 1864, Queen Victoria "Chalon Head", 2d pale blue, rouletted 7, N Z watermark, exceptionally well centered with huge margins showing rouletting all around, lightly cancelled, an Extremely Fine gem, Henry Lacoste Bartrop, Christie's Robson Lowe, October 1984, lot 1107; with 1951 R.P.S.L. certificate. Scott No. 28a. Campbell Paterson No. A2j (Z). SG No. 102 £750 ($980). 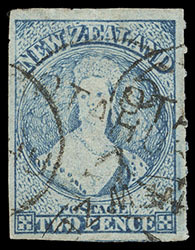 New Zealand, 1864, Queen Victoria "Chalon Head", 2d pale blue, rouletted 7, N Z watermark, large margins showing rouletting at right, strong color and impression, cancelled by "Otahuhu" postmark (Military outpost south of Auckland), fresh and Extremely Fine; with 2015 Odenweller certificate. Scott No. 28a. Campbell Paterson No. A2j (Z). 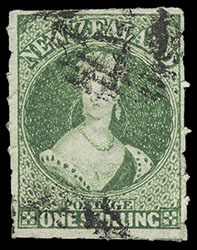 New Zealand, 1864, Queen Victoria "Chalon Head", 1s green, rouletted 7, N Z watermark, rouletting on all four sides, ric color on bright paper, indistinct numeral barred oval cancels, Extremely Fine and choice, Antipodes, Corinphila, September 1988, lot 3535; with 1988 Holcombe certificate. Scott No. 30a. Campbell Paterson No. A6h (Z). SG No. 104 £1,100 ($1,440). AN OUTSTANDING USED EXAMPLE OF THIS SCARCE STAMP.